Ancient Egyptian warriors raced into battle, shooting arrows from chariots pulled by horses. Foot soldiers were protected by shields, but only the most important soldiers wore bronze armor. The bow and arrow was the main weapon of the Egyptian army, although they had many others from which to choose. Make simple props to accessorize an Egyptian soldier costume for a party or theater production. 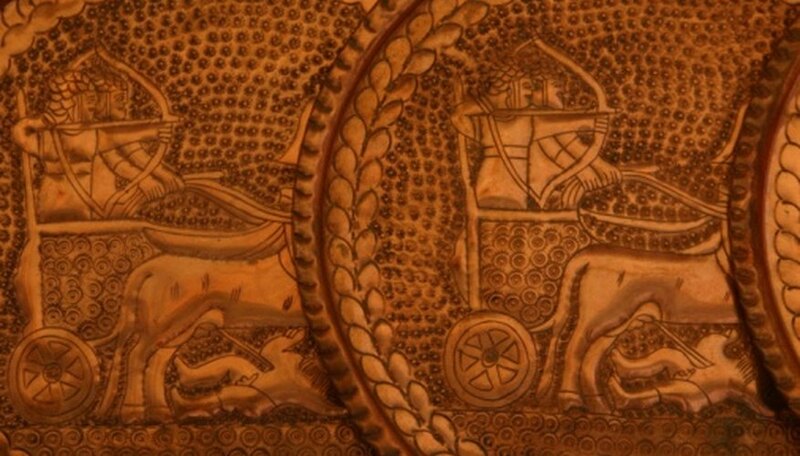 Charioteers carried bronze-tipped spears to use when they ran out of arrows so they were not left defenseless. Some long spears were also thrown like javelins and used for hunting large animals, such as lions. Make a fake spear by gluing a spear head cut from cardboard to a wooden stick or bamboo cane. Cut two identical pieces of cardboard and glue them together with the pole held firmly in place between them. Paint the spear head with bronze-colored paint. Soldiers carried long shields made of leather and wood to protect themselves in battle. Cut a shield shape from a large cardboard box. Make it pointed at the top and squared at the bottom. Paint it in neutral colors and decorate it with Egyptian hieroglyphs painted in black. Look at images online for inspiration. Tape a handle to the rear of the shield so the child can easily carry it. The bow and arrow was the most important weapon in Ancient Egypt. Bows were made from wood and had strings made from plant fiber. It took a lot of strength and many years of practice to become a good archer. The bowmen would send showers of arrows down on their enemies. Make a pretend bow and arrow from a flexible branch. Cut a notch in each end of the branch and tie on a length of string. Make arrows from long thin twigs. Cut arrow heads from craft foam and glue them to one end of each arrow. Glue bright-colored feathers to the other end. Maces were used in Ancient Egypt. They were wooden clubs with heavy heads shaped like a disk. Maces were a symbol of power because warriors needed enormous strength to swing them. Make a pretend mace using a large plastic foam ball glued to one end of a wooden branch or stick. Whittle the stick so it is smooth. Have an adult make a hole in the plastic foam to insert the stick into and glue it firmly in place. Paint the plastic foam ball black. Pretend weapons are intended for use solely as props. Never throw, shoot or aim them at other people, even in play, as you might cause unintentional harm. Kidipede: Ancient Egyptian Warfare - History For Kids!